History of Brasserie de Metropole Restaurant began with small café of Mr. Nemechinsky (known St. Petersburg restaurateur). It was opened here in the 18th century building of unknown Architect that was later rebuilt by Adrian Roben in 1847. At first the Café was named Gostiny Dvor after trading market across the street. Later it was renamed Lux. Among many patrons of growing Restaurant were mostly second guild merchants and St. Petersburg intellectuals such as poets, artists, journalists, students etc. 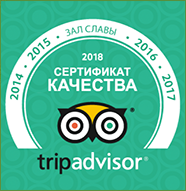 Also Lux was the favorite restaurant of Grigoriy Rasputin (famous mystic-figure who influenced Russian Emperor Nikolai II at the beginning of 20th century). In the beginning of 20th century owner of the restaurant went bankrupt and future Metropole has been sold to First Cooks and Waiters Cooperative. From this moment on the history of modern Metropole began. In 1931 restaurant was nationalized by Soviet Government and was named Metropole and within its building one of Metropole Pastry Factory was established. To this day Metropole pastry considered one of the best in the St. Petersburg. In time of Soviet Union Metropole mostly serve to Communist Party elite and honorary guests of the Union. Second floor of the restaurant had VIP Hall for local Party Elite that were also used in international events. For example Ronald Regan, Jacque Chiraque, Leonind Brezhnev were among many esteemed patrons of the Metropole. But the cuisine of the restaurant was nevertheless available to commoners. Throwing banquet in the Metropole was a mark of high social status In Leningrad (St. Petersburg name during Soviet period). In 2002 restaurant was closed down for renovations and then has been opened again in 2010 with the new name Brasserie de Metropole. Within the new Metropole one can find Belgium Pub with its own brewery and restaurant complex. Among the patrons of Brasserie de Metropole you can find famous politicians and artists such as Emir Kusturica, Rafael Vicente Correa Delgado (President of the Republic Of Ecuador), Martyn Jacques (Tiger Lilies), Fedor Bondachuk (Russian actor and film-director), Eduard Khil (Russian Opera singer), Mikhail Boyarsky (Russian actor and singer), Tatiana Bulanova (Russian singer), Sergey Shnurov (Russian poet and singer) etc. In pre-Soviet and Soviet era Metropole cuisine were Russian such as chicken meat chops, flank steak, coulibiac etc. In 2010 «Brasserie de Metropole» was performed— renovated elite restaraunt supplied with new wedding banquet hall. In after the renovation of 2010 Eric Cesari created menu in which he brought Belgium, Flemish and German culinary traditions. Enrico Bengoni and Eric Thor (Michelin 3 star chef) had also developed menu at Brasserie de Metropole. Today the Chef of Brasserie de Metropole is Aleksey Barinov who announced restoration of restaurant former glory to be his personal goal. The key feature is author approach to the cuisine. Either calendar year or Gastronomical changes, the seasonal dishes changing each other and it gives the Guests opportunity to choose a dish to satisfy their gastronomical tastes. 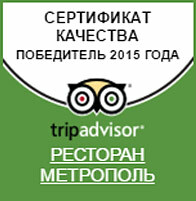 Metropole — is a Russian restaurant and the main cuisine must be Russian. And that what our cuisine shall be, but with author notes and touch of modern tendencies. For example there will be special list of dishes different from main menu in both serving and culinary process. We will change it seasonally, ingredient availability and with suppliers interesting promotions. Gijom Deneir is Chef-brewmaster of Brasserie de Metropole brewery. He started his carrier in 1992 when he still was in his teens. Mr. Deneir followed father footsteps who decided to create new brand of honey bio beer. Together they found a brewmaster in tiny brewery within south Belgium who agreed to try new recipe with this rarely used ingredient. That day Gijom realized who he wants to be. In 2003 Gijom got a degree in brewery craftsmanship and his carrier as brewmaster began. He found brewmaster with whom he had been acquainted 10 years ago during the period he and his father had brewed honey bio beer. François Tonglet being the brewmaster of Caracole brewery had agreed to take young Gijom under his wing and pass the secret of brewing on firewood. Firewood brewing is an ancient art and Caracole is the only brewery in the world which practices it. In 4 years in the Caracole Gijom took on challenges within every position in the Brewery, even materials purchasing to catering. This multi-functionality gave him an opportunity to become master in the art of brewing. Brasserie de Metropole has a great variety of dishes such as red caviar on ice, crab lasagna, shchi pohmelnie, tuna with asparagus and onion confiture, beef stroganoff with mashed potatoes and oyster mushrooms and many more. And in Brasserie de Metropole Pub you can enjoy hand brewed beers such as Brune, Blanch and Blond with delightful snacks. 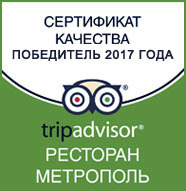 We are inviting you to visit Brasserie de Metropole restaurant taste exquisite cuisine and take a part in St. Petersburg history.